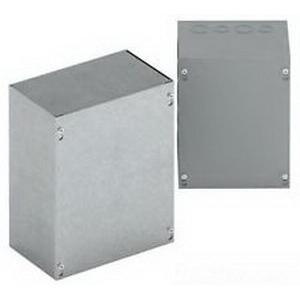 EBOX Screw cover junction box in ANSI 61 gray color, is useful as wiring boxes, junction and pull boxes. It safeguards against contact with enclosed equipment. It features 16-gauge painted steel construction and has acrylic electro-coated finish. It measures 4-Inch x 4-Inch x 4-Inch. Plated hex head combo screws secure the cover with the body. Keyhole slots provided in the cover allow easy access to inside without removing the screws. Enclosure body has mounting holes on the back. Junction box with knockouts, has NEMA 1 rating. Junction box is UL listed and CSA certified.